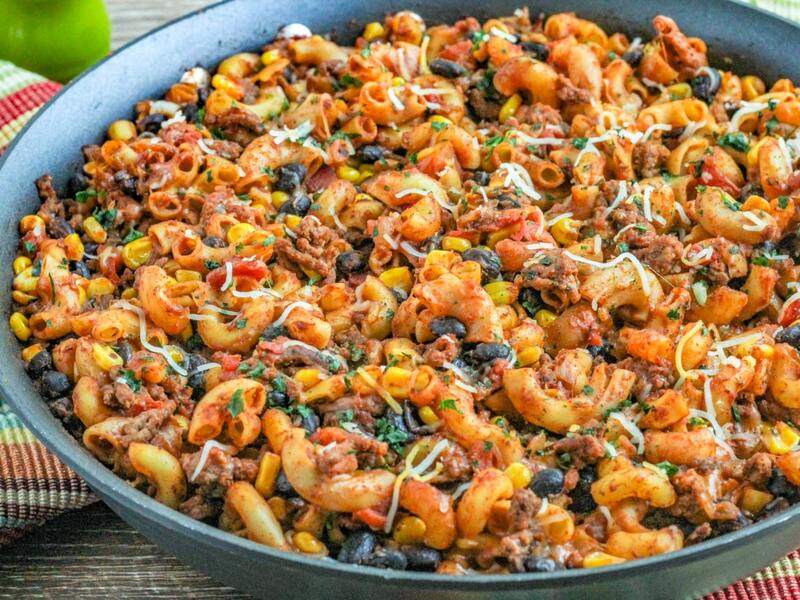 This Skillet Taco Mac and Cheese is a quick and easy 30 minute dinner that’s loaded with ground beef, pasta, tons of veggies. Plus it’s all prepared in one pan making cleaning up a snap! 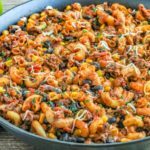 Skillet Taco Mac and Cheese is a 30 minute dinner that combines two of my favorite things: tacos and macaroni and cheese. You read that right dinner in 30 minutes and everything cooks in one skillet, even the pasta. That means you only have to wash one dish (I totally used paper plates) and that makes this recipe a real winner in my book. Now, I know this sounds like a crazy mash up but I promise I wouldn’t share this recipe with you if it wasn’t really good. You’ll need a big skillet I used a 12 inch non-stick skillet. If you don’t have a large skillet you can use a soup pot or dutch oven. That’s it. Easy Peasy, right? The only way it could be easier is if you had a personal chef. Of course if you had a chef on staff I’m sure he or she would still need the occasional night off and then you’d be really thankful for this easy foolproof recipe. Trust me. In a large skillet, cook the ground beef and onion until beef is browned and crumbled. Stir in tomatoes and chili, tomato paste, corn, taco seasoning, chili powder, garlic powder, water, salt and pepper. Bring to a boil stirring occasionally. 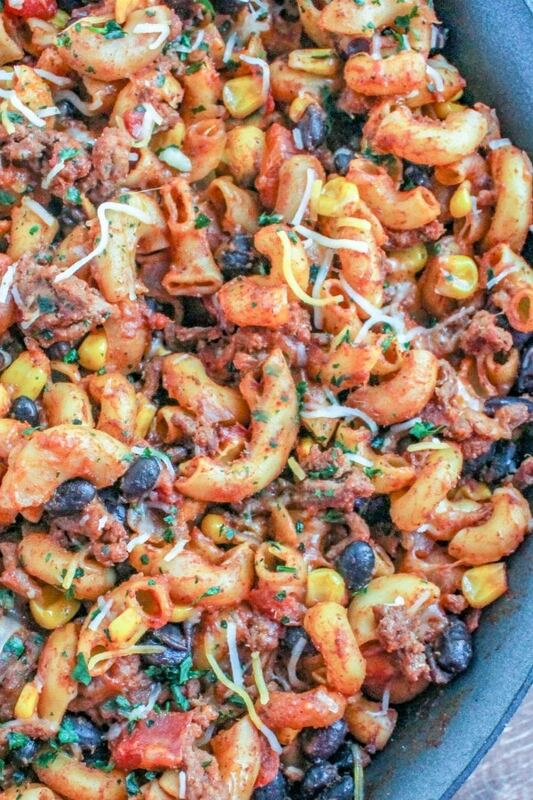 Add pasta to skillet and stir to combine. Cover with lid and reduce heat. Simmer for 15 minutes or until pasta is tender. Garnish with cheese and chopped cilantro if desired. This looks great. And I love when I have all the ingredients. Thanks for the recipe. This is perfect for my family, we love Mac and cheese with a little fling. Thank you for sharing such a great recipe! Now this is a awesome recipe. This is a recipe that young and old will eat!! Please, please forgive my ignorance but is 1 can of tomatoes and chilies the same thing as Rotel? Is it a sarge or small can? And did you add black beans to your dish? Thanks for your time! Yes, Lynee tomatoes and chiles is the same as Ro-Tel. 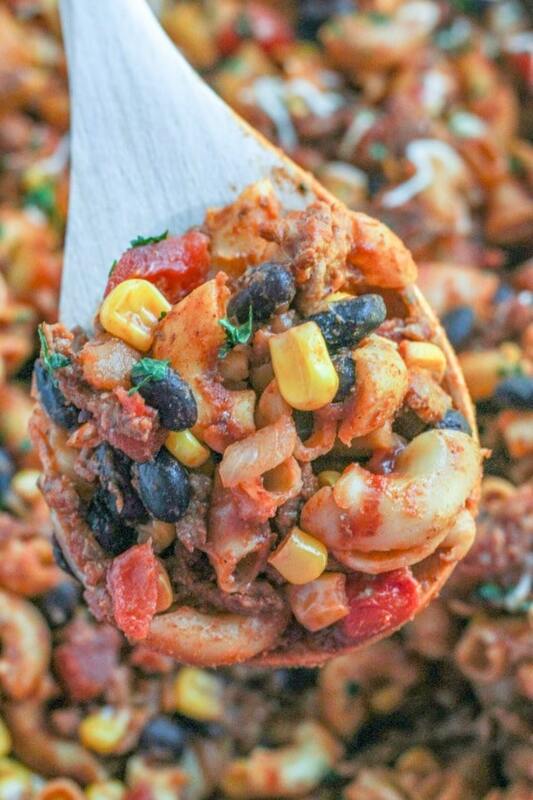 Thanks for stopping by and I hope you love this recipe for Skillet Taco Mac!